NBC's sophomore comedy from Parenthood and Friday Night Lights showrunner Jason Katims, About A Boy , finally returns for Season 2 on Tuesday night. If you're not already in love with this ridiculously adorable story — based on the movie of the same name starring Hugh Grant and a tiny Nicholas Hoult — you should be. It focuses on man-child Will, played by David Walton, and his relationship with his actual-child neighbor, Marcus, played by Benjamin Stockham. While Walton might play a great single Will on TV — sorry ladies and some gentleman — he's off the market in real life. 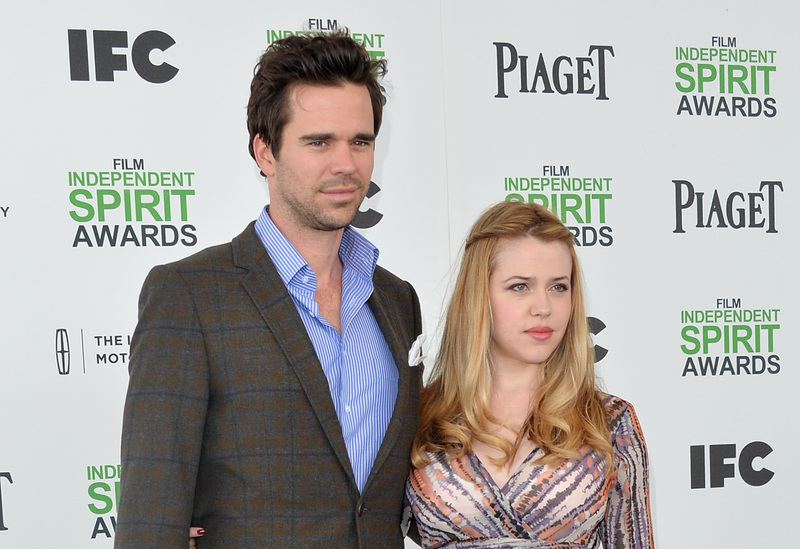 Walton is married to actress Majandra Delfino, who is no stranger to TV herself. Originally from Venezuela, Delfino has carved out a nice little fan base for herself. She had a small role as one of Tony Danza's daughters on The Tony Danzy Show, but it wasn't until her role in Roswell that she really started gaining traction. She played Maria DeLuca on the early Katims series from 1999 to 2002 (she was even married to Roswell costar, Devon Gummersall from 2007 to 2008). Since then, she's been working steadily in television and film, and has even found time to release some singles. She married Walton in 2011 in Miami (Katherine Heigl, another Roswell costar, was a bridesmaid, no big), and the couple has two adorable children, Cecilia Delphine, who's two, and Louis Augustus, who has his first birthday coming up in November. What else do you need to know about Walton's extremely talented wife? Here are some of her more memorable roles. During the run of this cult TV show, Delfino played Maria, a human who falls in love with an alien, but in a not-weird way. She was a main character for all three seasons, and as you may have guessed from the whole bridesmaid thing, her and Heigl became good friends. Delfino also had a role alongside Heigl in 2010's Life As We Know It. Set up as an Office spin-off, The Farm was slated to be Dwight-centric and focus on the on-goings of the Schrute family beet farm. Along with Dwight, it was to star his brother, played by Silicon Valley's Thomas Middleditch, and his sister, played by Delfino. The backdoor pilot for the series was shot, but the show was unfortunately not picked up. Instead, the episode aired during The Office's final season. Following the end of That's So Raven, Raven Simone made the jump over to ABC Family where she starred in this one-season show. Delfino played her best friend, Jo, as Raven's Georgia tried to break onto Broadway. It had all the normal ABC Family hijinks, but just couldn't connect with viewers and was canceled. Though this CBS show might have been canceled immediately after it premiered (okay, a few episodes after it premiered) a beautiful friendship was born out of it, involving Delfino and the one and only James Van Der Beek. I like to imagine that he and Delfino are still good friends, and sometimes they let Walton hang out with them too. She also made a lot of hilarious "Friends with..." jokes. She lent her voice talents to a view episodes of Roswell back in the day, and has released a handful of songs online. It appears that she hasn't recorded or released anything in a while — though she should — because her voice is really soothing in a smooth jazz way. Considering Walton's Will is a musican on About A Boy, how about we get Delfino in for a duet?